Are there questions you’re avoiding asking at work because you don’t want to know the answer? 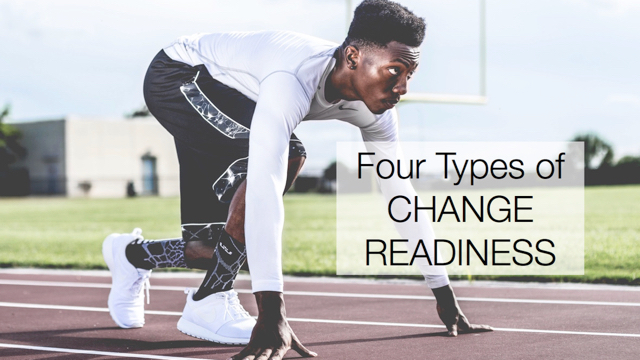 Perhaps the actions of a leader in your organization make you doubt their commitment to the change, but instead of asking where they stand, you get frustrated by their inconsistency. Or perhaps a colleague seems to be encroaching on your area, but rather than ask, you find yourself protecting your turf. You see ambiguous events unfold, and rather than find out what’s really happening, you jump to conclusions instead, and act as if they’re true. In the face of uncertainty, we react to events by filling in the gaps in our understanding with the worst-case scenario. Preparing for the worst possible interpretation of events allows us to protect ourselves. Unfortunately, it ends up increasing the perceived threat. In light of the worst-case possibility we play in our minds, we become defensive and start building up walls around us. We interpret subsequent events in a way that supports the worst case and shuts out other, more benign possibilities. Fearing the worst, we avoid finding out what’s really going on. Questions that would clarify the situation go unasked, just in case what we fear is really true. It’s probably not, but we’d rather not risk it. Staying in the dark only perpetuates the uncertainty. This is the Cycle of Uncertainty, and it may be the thing that prevents your change initiative from moving forward. Take a look in the mirror – where are you not gaining clarity because you’re afraid of what you’ll hear? Where are you deliberately keeping yourself in the dark? When you discover yourself avoiding asking questions because you’re afraid of the answer, it’s time to check your assumptions. Ask yourself: What do you know for sure? What don’t you know? What assumptions have you made to fill in the gaps of your understanding? Separate the fact from the fiction. Once you identify the stories you’ve made up to try to reduce your uncertainty, you can search for an alternate story that will help you move forward. How else could you interpret the facts? What other possibilities might fill in the gaps? How would you act if they were true? Select the assumptions that help you move forward. Since you’re making them up anyway, you might as well pick the ones that are enabling not disabling. Even with new assumptions, uncertainty is still the real problem. Armed with more positive interpretations of the situation, though, you no longer need to fear the worst. If the information exists that would reduce your uncertainty, then pursue clarity. What analysis would illuminate the real story? What questions could you ask that would reduce your uncertainty? If you can gain clarity by having a conversation, it’s time to have it. In times of uncertainty, we need to build relationships, not walls. 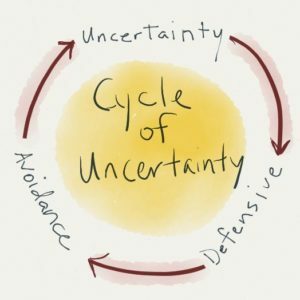 As a change agent, it’s important to recognize when you are trapped in the Cycle of Uncertainty. If you don’t, you’ll act out of fear instead of confidence. So, raise your awareness of being stuck in uncertainty, and choose hope over anxiety. Then, for others in your organization who are struggling with uncertainty, you can break the cycle by helping them check their assumptions, choose alternate ones, and pursue clarity where it exists. Reading the post a question raised it’s head: When we face uncertainty do we back-fill with the worst possible scenario? or do we pattern match based on previous experience and back-fill the most likely scenario (which could well be worst-case)? I’m not sure, but tend toward the latter as I think we learn cynicism rather than are born with it – watching my children grow probably sways me that way.